Our Military survival aids section is a great category for Cadets to explore. You can purchase our boot polishing kit which has all the necessities for polishing your boot in a professional manner, a great starter set for any new cadet. If your detachment plans to take part in field craft at camp then some cam cream would help you conceal yourself. Cam cream helps you blend into your environment by eliminating the shine on your face and using a variety of colours blends you into the surrounding environment, which is usually woodland or grassy areas, however we can provide desert versions which are more of a tan colour than the UK landscape of dark browns and greens. If you plan on making your own campfire to heat up your ration pack then we suggest giving military fire steel a try, simply rub the steel against the flint and you will make a spark, from here you can start a small campfire to heat up your rations. Only start fires under the supervision of your instructor and make sure you are a distance away from anything flammable, such as a tent. At Cadets UK we have a wide range of military and survival aids and products suitable for the military, cadets and outdoor enthusiasts such as hikers and campers. We can cater for your outdoor needs and offer very competitive pricing on our wide range of high quality products. Over the years we have gained a lot of knowledge as to what people want when looking for Military gear. All our accessories and survival aids are tested and tried out by experts and we can ensure you are receiving the best there is to offer. 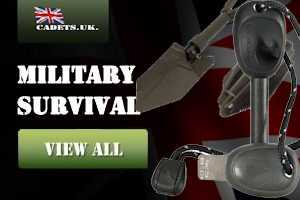 See our range of survival aids and tools. We have been supplying survival aids for over 28 years and have supplied Forces all over the world including the special forces in Africa. We have everything you need for an adventure from fire starting kits to ration packs. Ration packs are essential when it comes to any outdoor activity where you will be away from home overnight or are a distance away from any form of help. We recommend you bring a 24 hour ration pack in your rucksack,this is a great survival aid,every, time you take part in an outdoor activity where you cannot get food nearby. If you get in any trouble a ration pack will be able to keep your energy levels high as well as provide the needed calories and nutrients to keep you fully functional, this makes a ration pack a valuable source of food for any emergency. If you plan on taking part in outdoor activities for a number of days then we recommend using ration packs for your daily meals. Ration packs are designed to conserve as much space as possible and keep you well fed throughout the day, most can be eaten cold or can be heated up using a container filled with water, like our mess tins over a fire. Dry sacks are very tough bags designed to store equipment or clothing in that you don’t want to get wet, they seal making a resalable water tight cover around your clothing. Dry sacks are great if you want to ensure you have backup clothes that will stay dry.